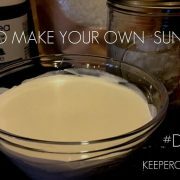 Have you ever wanted to make your own sunscreen? I had some hesitation, but it turns out that it’s easy and nourishing for your skin…not to mention quite a bit less expensive! 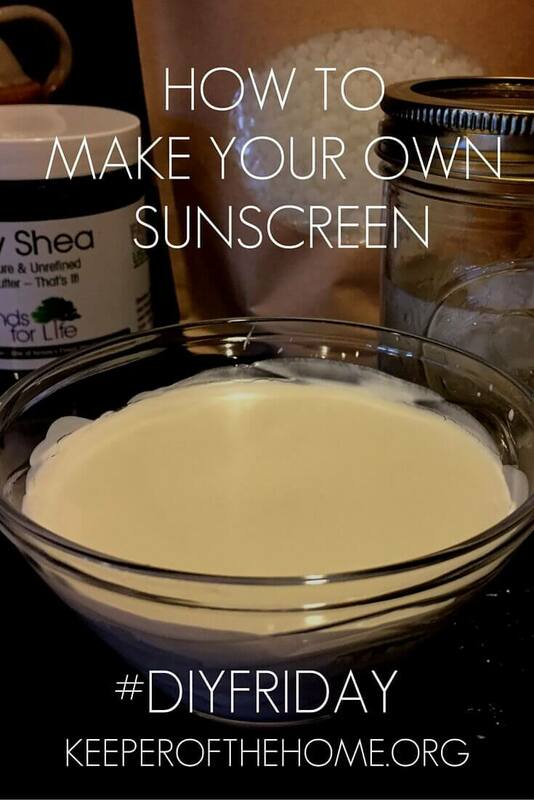 Making your own sunscreen just sounds, well, ew. I don’t usually shy away from making skin care products, like a sugar scrub we made a while back that left my skin feeling like silk, but I have to admit I was slightly overwhelmed at the idea of mixing anything with zinc. I just imagined those thick white zinc lines that guys put under their eyes and thought, NO. However, and you probably already know this, zinc oxide is really the safest option when it comes to protecting your skin with sunscreen. Did you know that zinc is also good for your skin for a number of other reasons, too? Zinc has been used for centuries to treat many skin conditions ranging from rosacea to warts, infections and even eczema and psoriasis. Our skin takes a beating every day and there are many factors that contribute to the damage that is caused. The sun’s UV rays, air pollution, chemicals in our personal care items, poor diet, not enough water intake, even stress and lack of exercise can all contribute! Believe it or not, zinc is one of the minerals that our bodies need to manage it all. Plus, zinc oxide offers broad-spectrum protection against damaging UVA and UVB rays when applied directly to the skin. Do we really need to use sunscreen? On a regular day-to-day basis our family does not use any sunscreen. We prevent sunburns by wearing appropriate clothing and building up our bodies own natural defenses spending lots of time outdoors in the spring and during the mornings. We rarely burn unless we spend an abnormal amount of time in the sun, for example while swimming or working in the yard. Speaking of that, I’ll be working in the yard this weekend now that it is finally starting to thaw out. I need to prepare my garden beds for planting and pull all those weeds that are creeping in! Especially that oxybenzone with my already hormone-wacky body! So I chose to nourish my skin instead with shea butter, coconut oil, beeswax, zinc oxide, and essential oils. These are natural ingredients that I already use on my skin and include in other skin care products that I make. Adding the zinc oxide provides more nourishment and also that barrier against the sun’s rays. Tto learn more about what to avoid and what to look for, I highly recommend the EWG Sunscreen Guide. In particular, take a look at the sunscreens that rated the best, and then some articles on sunscreen safety and efficacy. I set up a makeshift double boiler by setting a glass bowl over a pot of water at a low boil. Stir the oils and beeswax frequently until melted. Add the zinc oxide and stir together until smooth. I added about 10 drops of lavender essential oil to mine, but feel free to leave this step out completely. Note: not all essential oils are safe for use in the sun, please do your research if you choose to add them to a sunscreen. Pour mixture into a glass container that you can seal with a lid and let cool. Note that you want to clean your bowl and spoon right away. I very carefully used the boiling water from the pot and everything came clean just fine. You can see from the video that the homemade sunscreen easily blends into my skin without leaving that sticky white residue that I imagined! It felt just like any nourishing body butter that I usually make and naturally provides about an SPF of 30. Win-win! Do you use sunscreen? 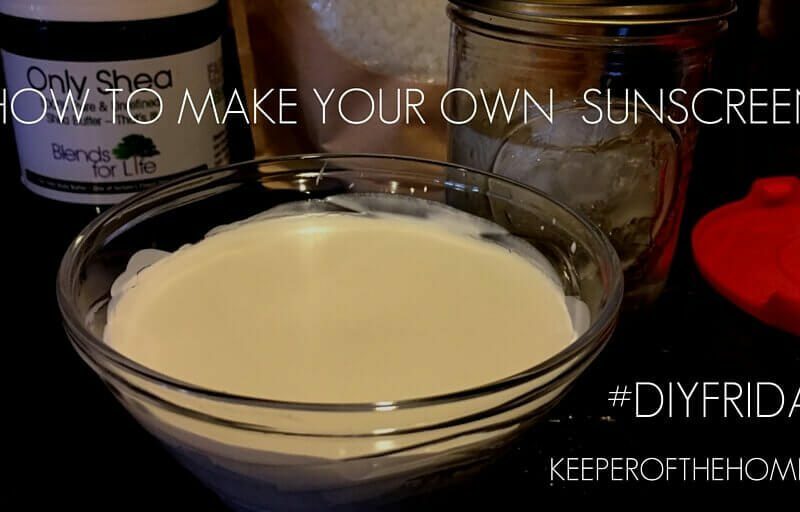 Have you ever made your own sunscreen? I’m pinning this. It looks great! Thank you! Any idea what the level of spf is on this sunscreen or how often it needs to be applied? Thanks so much!!! Hi Teresa, great question. Typically you want to reapply about every two hours, but if you are swimming or sweating reapply more often. The estimate is about an SPF of 30. One of my daughters is pretty fair skinned and used it the other day before playing outside in the afternoon. She put it on once before going out and then came back in to reapply once in the middle of the afternoon and did fine. Interesting to note, she burned in a small spot on her neck where she missed with the sunscreen, we reapplied sunscreen to that spot and the burn was gone within the hour. Thats some super nourishing sunscreen!! Great point Liesel, thanks for sharing! The ‘lavender’ essential oil is not dangerous to use in sunscreen, however it is important to note that you should always check before using essential oils when you are going out into the sun. Some are in fact reported as being photo-toxic and could be harmful, thanks again Liesel!